Music Matters is a project which aims to provide children and staff with high quality, varied, fun filled music making experiences which stimulate creativity, skill development, music intelligence and a love of music, using other art forms as an initial stimulus . Our recent project ran in 16 groups: Merkinch, Central, Dalneigh and Limetree Nursery all in Inverness, Tomnacross, Teanassie, Park Primary nursery in Invergordon, Craighill Nursery in Tain, and three Gaelic medium nurseries in Dingwall, Drumnadrochit and Tain. Each of the nurseries received 25 weeks of musical education workshops led by a Musical Specialist, drawing on the best of the Kodaly, Orff and Dalcroze approaches. In the first week of each of the 4 blocks, an artist from a different media visited with an activity as the stimulus for the musical experiences for the following weeks. This included bubble making, live music, and visual arts, storytelling/song workshops. The project finished with a wee concert for parents. Nursery staff music workshops were held at Anam Cara, which were also attended by UHI PGDE students, their lecturer, and representatives from Fèisean nan Gàidheal. Caroline McCluskey provided wonderful Orff training for our music specialists, and in partnership with Orff Scotland, invited both nursery, school staff and others working with young children, for a day of training. Read more about Music Matters Two which we ran in the fourth term. We were delighted that Creative Scotland, Bòrd na Gaidhlig, Highland Council , and NADFAS agreed to fund our project once again. 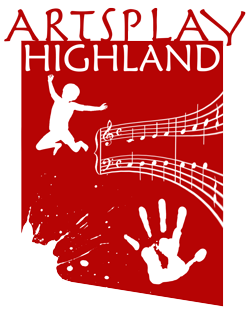 Our fourth year of Music Matters project finished in July and once again was enjoyed by children, the nursery staff, children's families who attend the ceilidhs and wee concerts, and the children and families of the Down’s Syndrome Scotland (Highlands and Islands Branch) . Our music specialists were very happy with the increase in children's musical abilities and their self-confidence, and cross-curricula learning.